We have hosted family reunions for the past 59 years at a small resort just outside Rocky Mountain National Park with 60 guests and 30 staff. Pack trips, instruction, child care, rafting (extra), hiking and fishing and wildlife viewing trips (one of the largest elk herds in the U.S.), jewelry classes—you can keep your creations (extra), free wine. and beer, masseuse (extra), pool, hot tubs, photography hikes with a professional who will photograph your reunion free of charge, sightseeing trips, pets welcome. 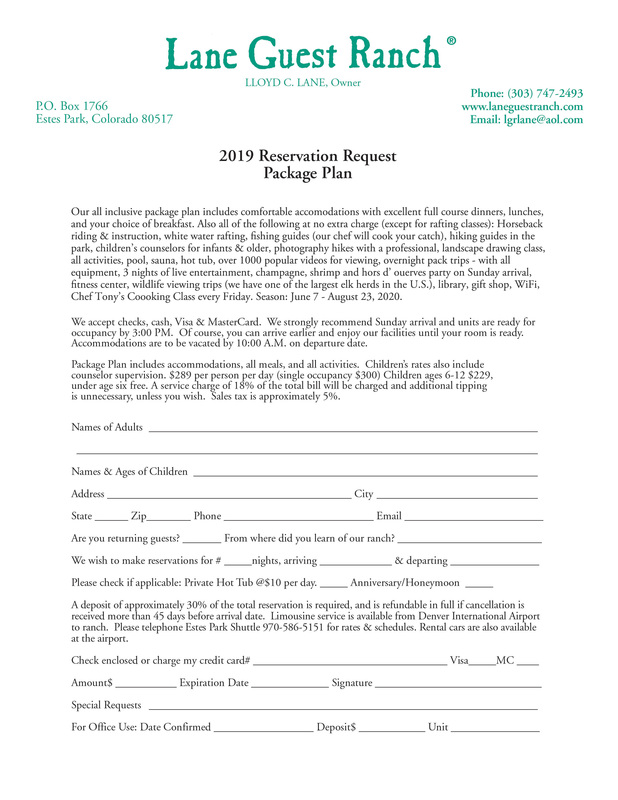 Request a free copy of a video of Rocky Mountain National Park where we hike, ride, and fish that you can share with all families in your reunion. Complimentary flowers and champagne in your unit for anniversaries. The Doctor's House and the Governor's house, and idividual units are popular choices for accommodations. We have some anniversaries reserved for 2014 at this time. See family reunion comments on their stay listed under References.